How Can Hashtags Grow Your Audience? Hashtags are getting bigger than ever! Have you heard about the deal between Twitter and Google? If you haven’t, you’ll want to google that. An important aspect of digital marketing is growing your audience. Hashtags can help you do just that. So What’s a Hashtag Anyway? Essentially, a hashtag is any string of characters preceded by a pound sign. The only rule is that it can’t have spaces. Chris Messina (former Google UX Designer) proposed the concept of hashtags in 2007, in a famous tweet. Like many good ideas, it got rejected until someone important saw the wisdom behind the concept. In 2009, Twitter made hashtagged keywords a hyperlink. Now, clicking the hashtag brings you to a stream of all tweets containing the hashtag. Essentially, think of it as another keyword or subject related to a post/tweet. AKA, another piece of metadata. It’s data about data. If you make a post about optimizing your AdWords account, adding #adwords to your tweet will increase the number of people that can see the post. You may even want to add another related hashtag like #SEO, #PPC, or #marketing. However, be careful because you can accidentally overdo it. According to Buddy Media (Acquired by Salesforce) hashtags work best when you place one or two of them in a post. They measured a 21% higher rate of engagement on those posts. Conversely, they measured a decrease of 17% in engagement when you use more than two. So don’t overdo it! (I don’t want to stifle your creativity but maybe stop at three… maybe). Why do Marketers like Hashtags? To start, grouping messages by context is always conducive to analysis. You can use a free service such as Ritetag to measure the popularity of hashtags. Here are some questions that Ritetag can help you answer about all the tweets that contain a certain hashtag. What is the number of retweets? – Represents the likelihood that your tweet will be retweeted. How many people view this hashtag per hour? Indicates how many people will potentially see your tweet due to your use of this hashtag. This is also known as the number of impressions. In addition, you will see a percentage that describes the content in this subset of tweets. How often do they include images? What percent of them have links? What ratio of these tweets mention a profile? Additionally, Ritetag helps by showing you the trend graph for the hashtag. This gives you an idea of stats over time. The three graphs below describe different trends for the selected hashtag. Volume – Shows two trend lines: the top one represents the level of Unique Tweets, and the green one below that represents the number of retweets. You can mouse over each node to see the exact stats. Reach – This shows the level of potential views over time. Notice that on July 2nd there was a spike. Usually the reach for #analytics is around 100K but on July 2nd it jumped to 2.2 million. What happened? This would require a little research but it wouldn’t be impossible to pin down the cause of the spike. Structure – First think of a bubble, that’s Twitter. Now inside of this bubble there are many other bubbles. Consider each bubble a subset of the whole, and all of the tweets with the hashtag #analytics is a population of tweets. The structure section shows you how the structure of those tweets changes over time. Once again you can mouseover a node to see percentages. In the example below you can see that the level of links stays relatively constant but the rate of mentions fluctuates, especially from June 21st to 22nd. Additionally, you should check out the RiteTag Chrome App which integrates well with social sharing platforms such as HootSuite and Buffer. These social sharing platforms help with scheduling your tweets/posts and much, much, more. Let’s say I come across an article about finance and I want to schedule it to be shared on my social accounts. Here is an example of the way the Chrome App integrates with Buffer. The stats that we found on the RiteTag site are now easily viewed in the Buffer post creator that pops up when you use the Buffer Chrome App to share the page you are currently on. This enables you to do many things very quickly. Add pound signs in front of a word and instantly see if it is a good hashtag. 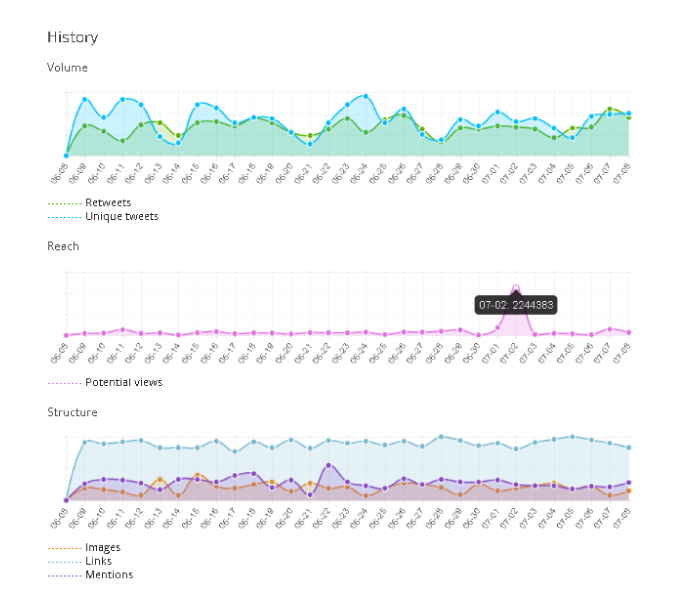 Quickly glance at the metrics related to your hashtags. Find images related to your hashtags (Twitter, Flickr, Imgur, Instagram) – Quickly add them to your post. Use power scheduler to set a post to be shared multiple times – Tweets are ephemeral i.e. they don’t last for a long time. It depends on how many people you follow but either way, it’s easy to miss a tweet. I like to use my twitter analytics to identify successful tweets and schedule them out a couple more times in the coming weeks. Here is a video demonstrating how to set up and use Buffer and RiteTag. Use RiteTag to add hashtags intelligently. Use Buffer to schedule tweets. Learn about RiteTag integrations with Buffer that makes Mentions, Images, Hashtags, URL Shortening and much more a breeze.